Finishing plants outdoors when temperatures are just above freezing can help production in many ways. By increasing your production space and moving more mature crops outside, you can increase the spacing on the remaining plants or order in new plants to get more out of every season. Finishing outdoors under cool temperatures also helps acclimate plants to the outdoor environment, making them tougher, more compact, and increases the plants’ survival rates for your customers when they transplant them. The cool temperatures will slow the crops, so plan for that, but the benefits usually outweigh the longer crop times. 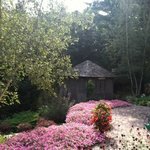 New to perennials, or just need a few solid recommendations? Try these five genera which are recommended by our growers for their ease in finished greenhouse production. Designing, planting and maintaining landscapes for ecologically-minded customers requires a shift in the way we think about and care for gardens. Plants play a huge roll in providing pollen, nectar and seeds for bees, butterflies, hummingbirds, songbirds and insects. Learn more about gardening for pollinators here. You'll love these cannas which are fast and easy for greenhouse production. The fourth in a wildly popular series, meet the phenomenal new Supertunia® Picasso in Purple™.